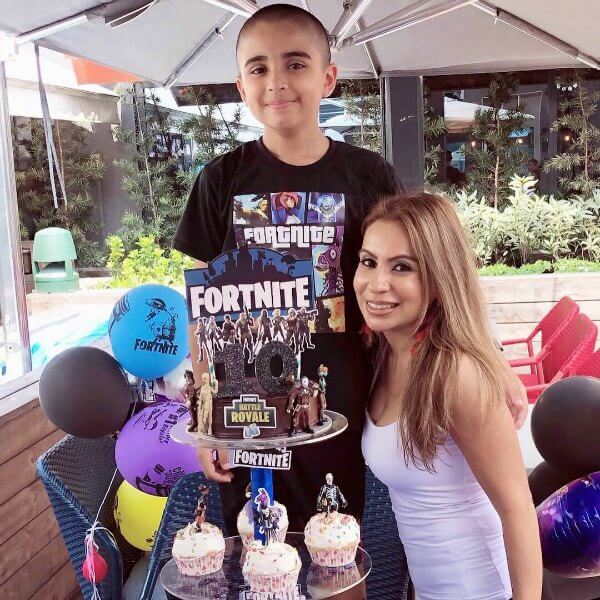 Not sure what the hype is about Fortnite & not totally convinced that my boys should be playing the game, but decided to be a “cool” mom (are the kids even saying that word anymore) and let Zayden have a Fortnite themed 10th birthday party!! 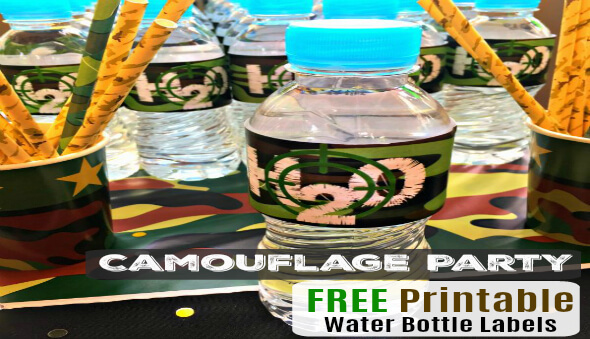 Fortnite is a very popular game with kids these days, however since it is fairly new (2017), there is not much ready made party stuff (table covers, plates, hats, goodie bag gifts, etc) to purchase. Hence, you will need to get a bit creative with this theme. 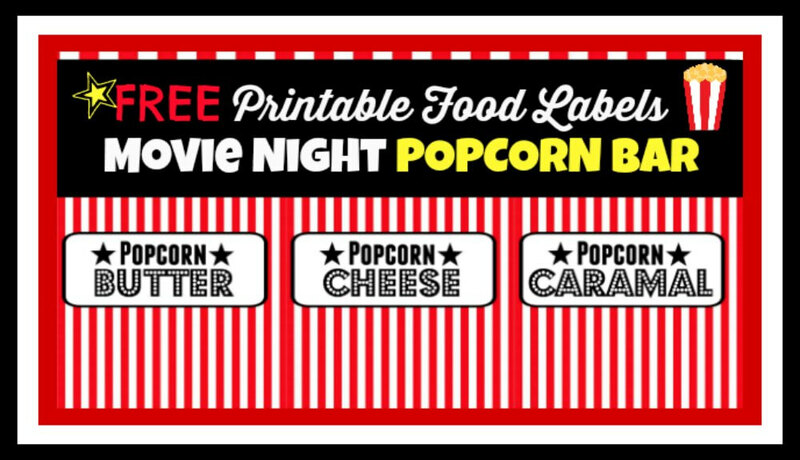 Normally I spend months planning our birthday parties, but this year SuperMommy is a bit partied out, so decided to keep it simple and do it DIY style! 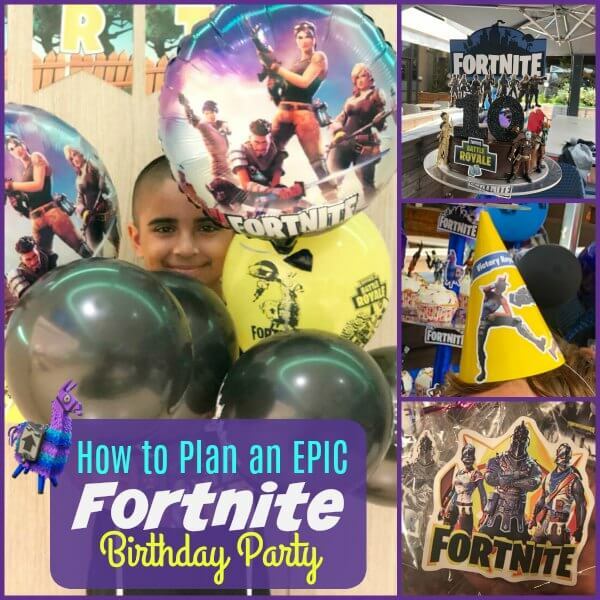 Here are some tips and ideas on how to plan an awesome Fortnite party for your kids without breaking the bank. 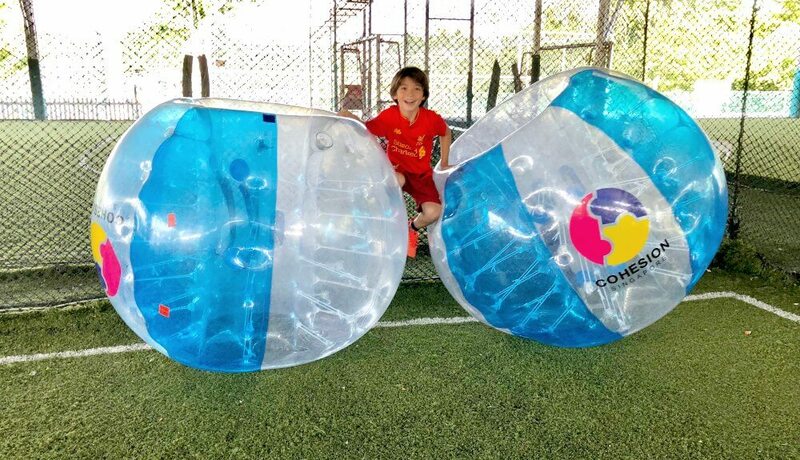 There are many different activities and games that you can incorporate into your kids Fortnite party. Even if the activity does not necessarily fit with the theme, you can use some creative words and make it work for your party. A NERF Fortnite shootout is very easy to plan and actually does not cost that much to put together. Ask all the kids to bring their favorite NERF gun from home and supplement this with your kids own guns. Alternatively, you can provide each kid with a gun (this can be their goodie bag gift to take home as well). For Zayden’s party we did a Nerf Shootout. 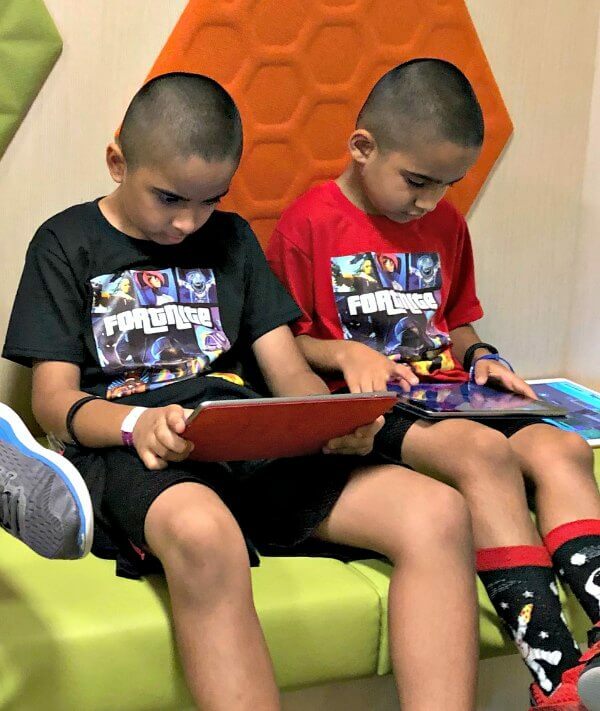 We provided each kid with a Fortnite T-shirt either red or black to differentiate the teams. In addition to that we brought all of our NERF rival masks, as well as additional superhero masks, to make sure the kids had their faces covered. We provided all the bullets for the game, which we purchased in bulk online – all generic bullets, so it did not cost that much. 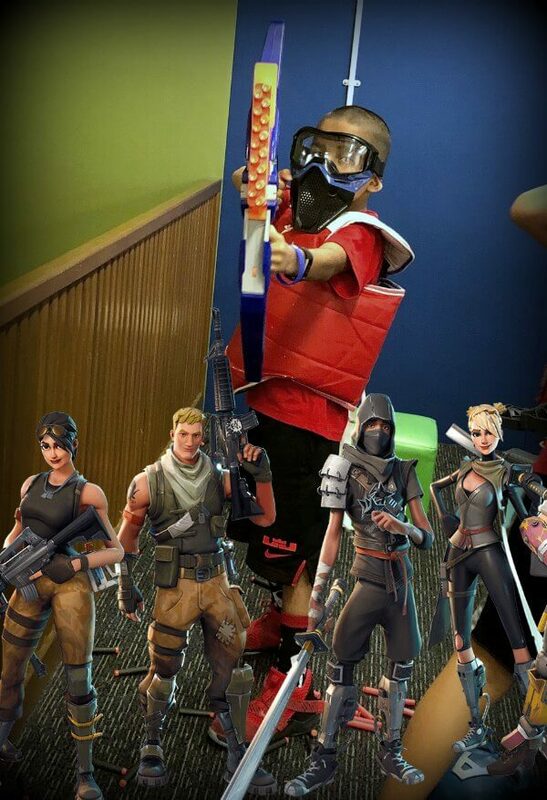 Super Fortnite Party Tip: If you want to do a little more, you can print out some of Fortnite characters into large posters or cutouts and have the kids shoot at them as targets – this will work for both the NERF Shootout and Water Battle! Laser Tag is another great Fortnite party activity and totally fits into the theme. Laser Tag requires more a bit more planning then NERF, as you need to either hire an outside laser tag company or go to a laser tag party venue for the activities. Similar to Laser Tag and NERF, Fortnite Paint Ball would also be a fun Fortnite themed activity. This will also require some skillful planning with an outside company. A Fortnite water gun, super soaker battle is a great party idea for a hot summer day. 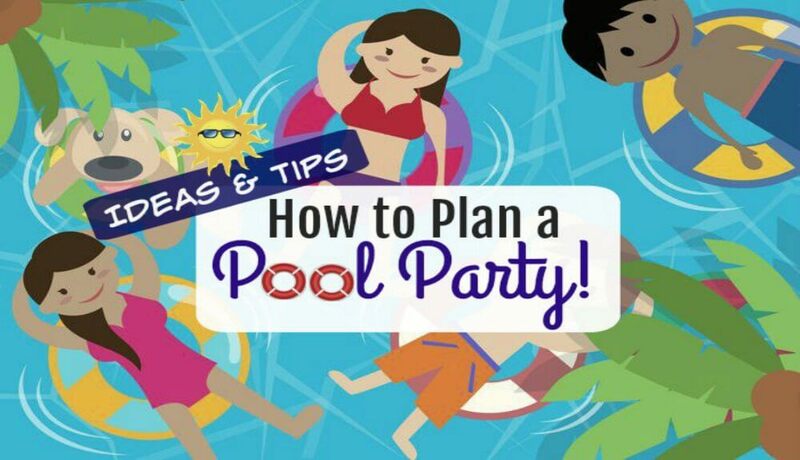 This is very easy to plan – all you need is a variety of water guns and soakers. If you can have the party at the pool it will be even better, however you can still do this outside and have fun. If you want to do something extra, make some team colored water balloon grenades for each team to use. The Fortnite video game has a llama pinata that carries a variety of supplies. You too can find a way to incorporate this llama pinata into your party. Even older kids and adults love hitting pinatas (just make sure you get a strong one). You can either make your own pinata at home ( click here to read my article on How to Make Your Own Pinata), or you can just buy a Fortnite llama pinata (you can find this online). Super Note: Feel free to get creative with what you put inside the pinata. 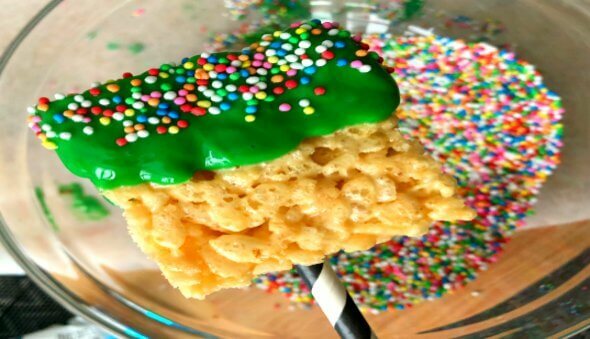 Here is a helpful list of 25+ Things to Put in a Pinata Besides Candy. You can even stuff the pinata with NERF bullets that the kids use for their shootout. A Fortnite dance off can be added to any type of Fortnite party that you choose. You can have the kids dance solo or team up to show off their best Fortnite dance moves. All the dance moves are available on YouTube. Fortnite is an online video game where you need to battle against other players. For your party, you can plan an all out Fortnite online gaming battle. 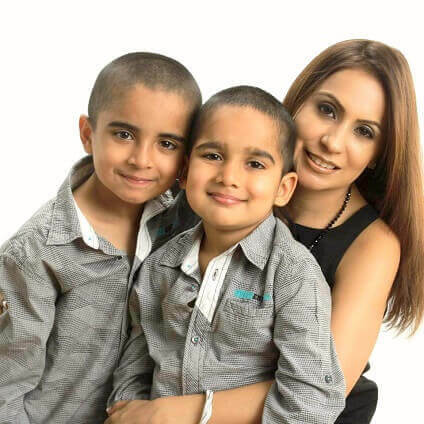 Some kids can play on the big screen, while others play on iPads or the handheld devices. Have kids bring their own devices. 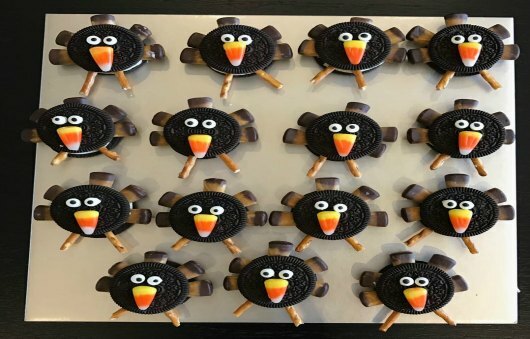 This is probably the easiest type of Fortnite party to plan – us moms may not like the idea, but trust me the kids LOVE it. Super Fortnite Gaming Party Tip: If you do plan to have a online gaming party, my recommendation is to start off with a scavenger hunt and then incorporate a dance off (and maybe the pinata) in between the gaming. A Fortnite Scavenger Hunt is very similar to what you need to do in a real Fortnite video game. 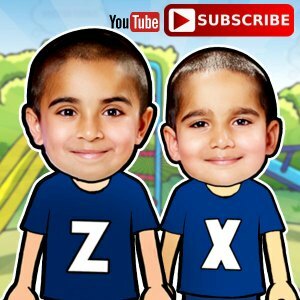 At the party, kids would need to find and decipher hidden clues in the battle arena, which would lead them to the ultimate prize. The prize can be the cake, goodie bags, game tokens, or even a box full of plastic weapons/guns that you use for your next activity. If you are still not sure what to do for your Fortnite party, or just want to keep it simple, you can opt to do Fortnite Bowling. Fortnite bowling requires an outside venue, but is easy to organize and does not require much work on your part. Just incorporate some of the other Fortnite theme ideas at the Bowling Alley & viola – you have a Fortnite party! Keep it simple or go complex, it’s up to you. But remember a little can go a long way – so decide what is the best way to spend your party budget. 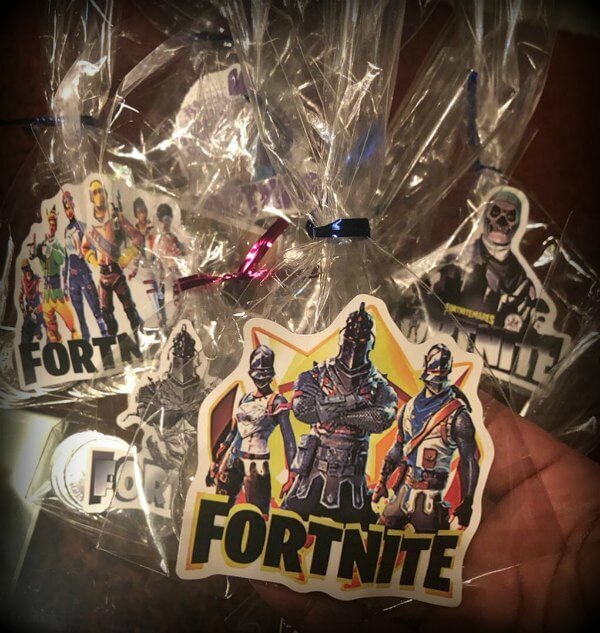 As I mentioned, there is very little mainstream Fortnite party stuff available, which means you need to either get creative, use Etsy, or pick another theme. 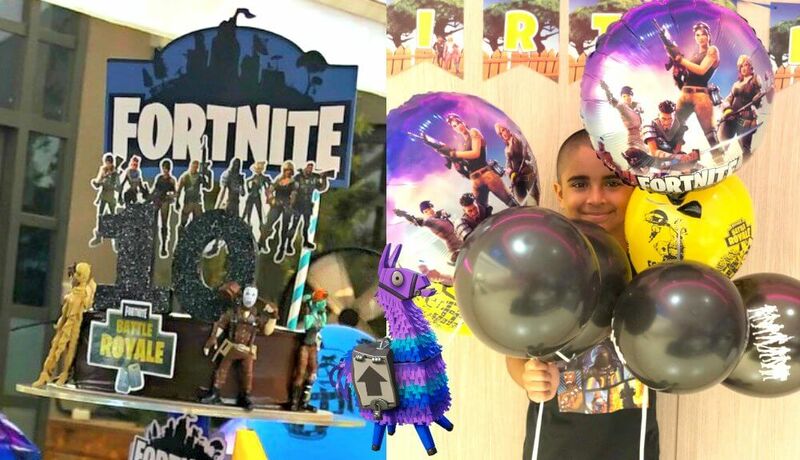 For Zayden’s Birthday I purchased a bunch of random Fortnite stuff from Lazada and Shopee in Singapore. Super Online Shopping Tip: If you plan on buying the Fortnite items online, you must plan at least one month in advance. Many of these items take 14-21 days to arrive (and you don’t want to have a panic attack the night before if you things have still not arrived). Normally my party items all come from the US, however surprisingly for this Fortnite party I found that the price on the US Amazon site is substantially higher than what I paid on my local Asian sites. 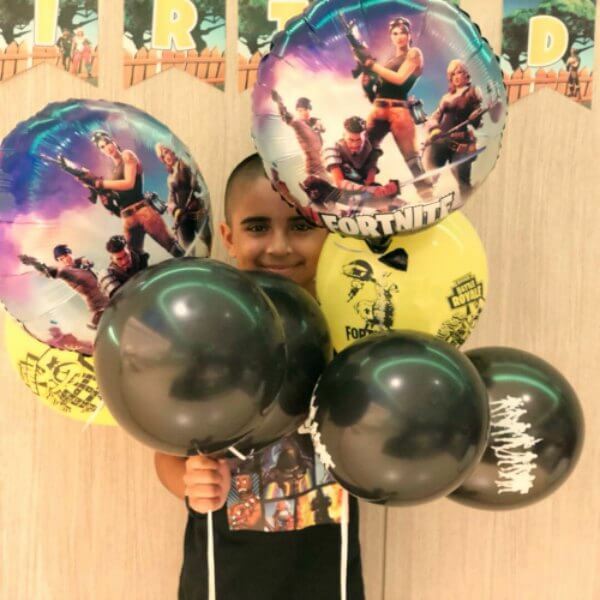 Fortnite balloons really help show off your Fortnite party theme. You can pair the balloons with any of the complimentary colors to set the mood. There is no need to buy additional tableware or fancy decorations. The Fortnite stickers are a must have! 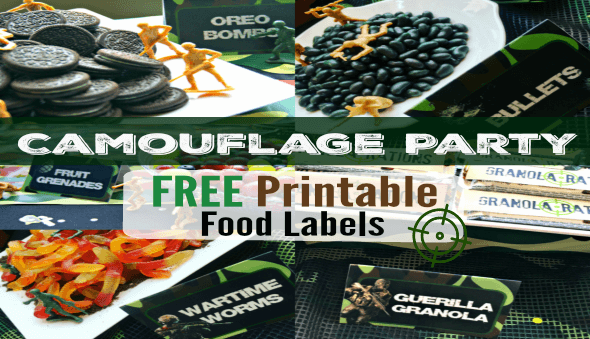 They definitely bring the whole party theme together and perfect for any DIY activity of your choosing. 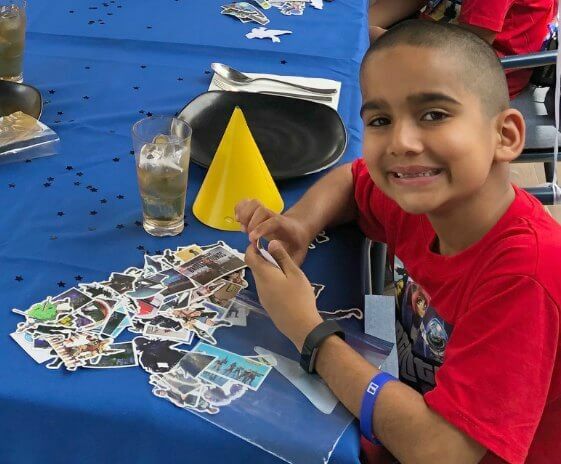 You can use the stickers to decorate your plastic party cups, use it as confetti, on party bags, decorate the cake stand, make cupcake toppers (just add a toothpick to the back), etc. In addition to my decorating just about everything with these stickers, party guests were able to make their own DIY party hat while we waited for the food to arrive. Super Fortnite Party Note: The Fortnite stickers were super cheap – SG$1.95 (US$1.50) per pack of 100, so I bought a pack for each of the goodie bags and one for myself to decorate. I was actually very impressed with the sticker quality – I did not realize that the stickers would be so big and of such good quality when purchasing. Just FYI, the same pack of stickers sells for US$7.99 on Amazon. 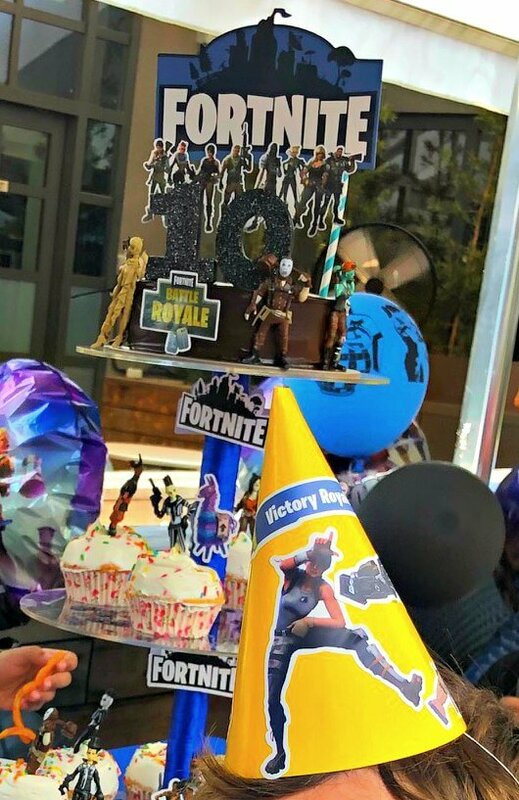 The Fortnite shirts are not a must have, but since there was not that much other Fortnite decoration, the shirts really helped. I purchased these at a reasonable price online and also made a great goodie bag gift to take home. I also purchased some Fortnite bracelets which the kids wore during the party. 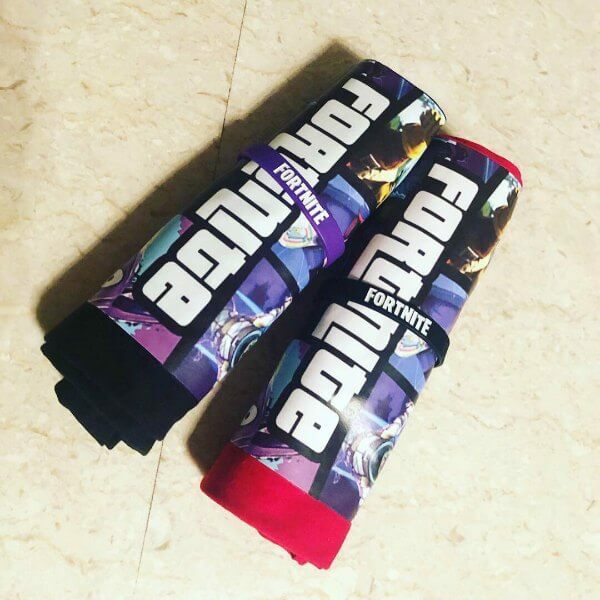 Super Fortnite Party Tip: Make sure you buy at least one size larger than what you think the kids will wear. The shirts I purchased came from China and were smaller than the size indicated. Every year I spend hundreds of dollars on a themed fondant, over-the-top cake. 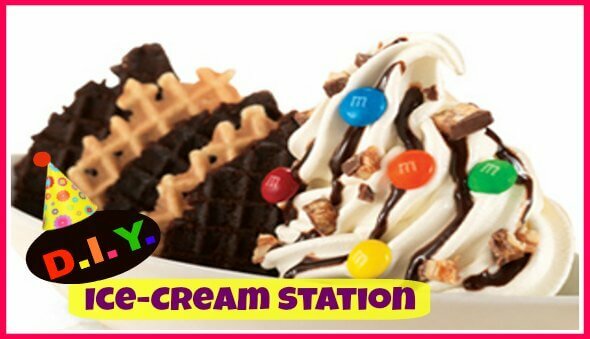 Yes, it looks cool, but seriously it’s not worth it! This decided to make my own DIY Fortnite cake using a store bought cake topper. Now you don’t need to buy this cake topper – it can easily be made by printing things out on your computer. In addition to the topper, I added some of the Fortnight action figures and a big glitter candles. 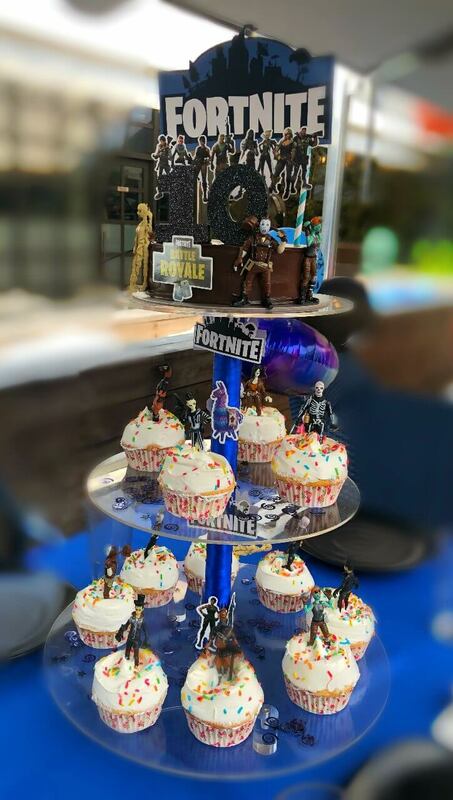 This was paired with some Fortnite cupcakes (using the action figures as toppers). It looked awesome and didn’t cost that much to do. 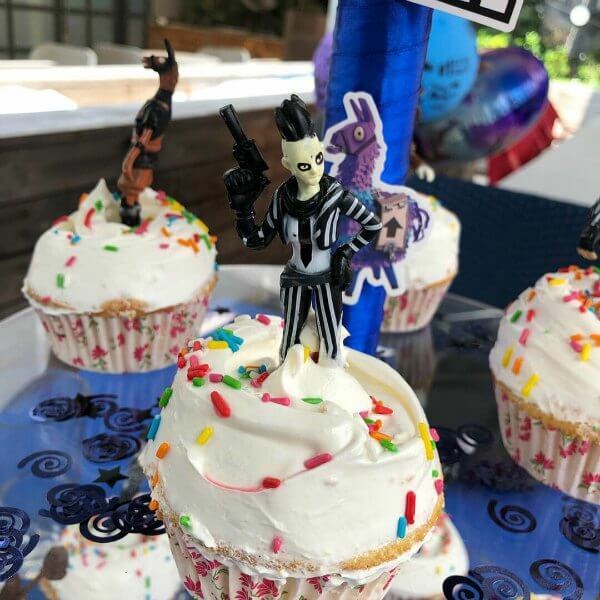 The Fortnite action figures will make a good addition to your food / candy table and also make the perfect cupcake topper. These can also be included as a goodie bag take home gift. Good luck with your own party planning!